SEO plays a major role in online marketing and has a vital part in the online presence of any business. As a leading Digital Marketing Agency, we think SEO is essential to optimise your content for online success. In order to improve their content marketing strategies, every Digital Marketing Company needs to do a timely SEO analysis. Analytical tools that gauge the performance of off-page factors like link-building and social media engagements are the ideal tools. One can understand how search engines and visitors are evaluating your website with the help of these SEO analytical tools. 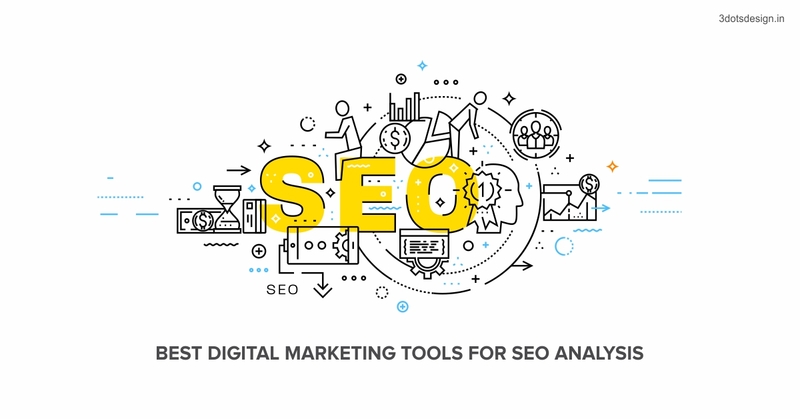 Here are some free digital marketing tools for SEO analysis. Google Analytics is already quite popular, but if you are new to SEO this information would be useful. It can be called as a hammer in your SEO toolkit. It is a free and easy-to-use tool that complements other SEO tools. This tool tracks the traffic coming into your site and analyses the visitor’s behavior. It also lets you track which webpage is performing well on a regular basis.It informs you which keywords are boosting website traffic. You can develop a new Digital Marketing Strategy or improvise on the existing strategy with the use of this simple tool. This is a highly recommended tool. Google Search Console is formally known as Webmaster Tool is one of the best choices for a SEO tool. This tool helps to give your site a regular service and run everything smoothly. It helps to spot bigger issues quickly which is a major advantage. The tool allows you to see which queries bring users to your site. Also it analyses your site’s impressions, clicks and position on Google Search. With this tool you can submit your individual URLs to Google and review your index coverage to make sure that Google has the freshest view of your site. A major factor which affects your ranking by the search engines is loading speed of your website. Enter a URL and this tool will check the loading time and performance of your website against the industry standards and best practices. Screaming Frog is a small desktop program. You can install the tool locally which fetches key onsite elements for SEO. It includes server errors, broken links, duplicate pages and blocked URLs. SEO Spider also crawls your website to analyse title and meta descriptions, determining required length and relevance. It’s particularly good for analysing medium to large sites, where manually checking every page would be extremely labourious. It finds out errors on more than 6 dozen parameters. This includes domain overview, image optimisation, link data analysis, mobile friendliness, keyword grouping, competitor SEO etc. Note that this tool is free for only 15 days and charges apply after that. It is an extension which allows you to check any webpage for SEO parameters and export the data into a file. It can show the total number of indexed pages, domain age, social shares and external links. Instead of individually checking sites through a stand-alone tool, you can view real-time stats as you browse. It also offers a free on-page audit tool so that you know if there are any errors on your site. It is an excellent site audit tool that has a great demand among professionals. It reports errors, obstacles, and quality of performance and gives the report in PDF format. Note that this tool is free for only 10 days as a trial. The main purpose of SEMrush is keyword research. SEMrush is a super elaborate dashboard. It reports on the performance of domains as a whole and their specific pages. The website offers numerous toolkits, one of which is an SEO tool kit. It allows you to plug in a website page to see for what keywords it’s ranking, what the page’s rank is for that keyword and the keyword’s monthly search volume. Note that you can try the tool for up to 10 free keyword searches and it is not entirely free. This tool gives you insight into the volume of monthly searches for a particular keyword and how much competition there is, based on advertising spend for sponsored links. Copyscape is an online content checker because there is high chance of duplicate content. The tool checks if similar text appears anywhere else on the web. Having unique content is essential for a website because it affects the ranking in search engines. Simply enter the URL for a website or blog post and Copyscape can tell you where else that content exists online. You can start with the free tools to understand which tools are suitable for you. Remember you can upgrade to a paid plan when you feel it is the right time to do so. These tools can be used by Creative agencies, SEO agency and professionals. We are a digital marketing and advertising agency in Pune and we highly recommend these tools.